We have a simple philosophy - the job is only done once the client is 100% happy. But don't just take our word for it ... on this page you'll find reviews from sites like Google and Product Review. We've also included some of the emails and letters we've received from customers who chose us for their kitchen renovations. We can't thank Rosemount enough not only for their superb work, but for their project management, and for ensuring that a complete kitchen re-build was performed with as little disruption as possible to our household. Having had plenty of work done around the house over the years, I recognise and appreciate quality work, and Rosemount provide that in abundance. They're also terrific people to deal with, and we've enjoyed meeting them. Quality kitchen renovations are not cheap so there is always an element of anxiety when the project commences that you will end up with a great functional quality kitchen and value for money. This is what we got with Rosemount Kitchens. It has added value to the property and it really looks impressive and timeless. Absolutely thrilled with our new kitchen. Rosemount were fantastic to work with from start to finish. Incredible communication, service, and quality. Matt and his team went out of their way to ensure we were happy with all aspects of the kitchen. Would absolutely recommend to anyone and would use Rosemount again without a second thought. Our three-year-old kitchen works as well as when it was first installed. This is due to the quality of the product, and the quality and professionalism of all involved with the installation; from the designer and check measurer to the master tradesmen - installer, electrician, plumber, tiler and the project site manager. Our kitchen was installed in seven days the week before Christmas. We are still extremely happy and will highly recommend Rosemount Kitchens whenever we have the opportunity. For Sue and I this was a major undertaking and we went in to it oblivious to most of the hurdles that would occur during the project. Your boys, from Reuben onwards, made this an easy and mostly seamless undertaking for us, and the results are significantly better than we anticipated. To say we are delighted with our new kitchen is a gross understatement. It is just sensational. All of our friends who have visited in the last two weeks have agreed that this is a beautiful kitchen. Please pass on our thanks to everyone who contributed. To Matt, Alan, Owen and your electrician, plumber, plasterer, tiler and splash-back man - I hope I haven’t missed anyone. They all did an excellent job and we would recommend Rosemount Kitchens to anyone who is in the market for a new kitchen. Rosemount were by far the best of the trades we dealt with in our whole renovation, and continue to be. And we had a great kitchen designer who was clearly excited about doing something a bit different and edgier. He really brought some of my ideas in the kitchen to life, and designed all of the laundry. The pantry is beautiful too – it just works really well. We are thrilled with our new Rosemount kitchen. We love our new kitchen and have been very proud to show it off to all our family and friends. The team of people who worked on our kitchen were professional every step of the way. We never had to worry about the tradesmen coming and going, as they were all very trustworthy. The design was beyond our expectations and the ideas given for storage solutions work wonderfully. Thank you for taking over the renovation from start to finish. Michelle and I are very happy with the kitchen. The quality of the build cannot be faulted and the level of service we have experienced from Rosemount has been exceptionally good. Everyone we spoke to over the phone and those that visited our house were a delight to deal with. Nothing was too much trouble and they were very careful in regard to other trades working on our extensive renovations. We can highly recommend Rosemount and would be happy for you to post this quote on your website. I remember when I had delayed your start date for the second time, because of problems we were having with other trades, you said: "It's OK Tony, we will work around it - let Rosemount be the least of your worries." And that you were! Special thanks to Matt, Beryl, John, Alan and Owen. Thanks for a great product and great service. Thank you to Rosemount Kitchens. We could not have asked for a better experience. My wife was not looking forward to the renovation, but the whole process from start to finish went smoothly and did not drastically disrupt our household. From our first meeting we felt comfortable and confident that Rosemount Kitchens was the right choice and they did not disappoint. We will spread the word. I thought there might be hiccups with teeing up tradies, delays and things. But we didn’t experience any of those. We were always kept in the loop and knew what was happening. We needed a whole household of joinery… Thank you to the Rosemount team for the service provided in the completion of our property development. We needed a whole household of joinery from the kitchen to TV units. The designer was professional and gave us some great ideas. The installation team had to work around all the others trades in the property and they also were very professional and did a splendid job. We would recommend the team at Rosemount kitchens and would not hesitate to use them again in the future. Our designer was a great adviser. He knew a lot about things we didn't even think about. We have referred loads of people to Rosemount. They weren’t the cheapest company but for me it’s about the quality of the product. You get what you pay for. Seeing the design in 3D, helped us visualize the design… We already had worked out basically what we wanted in our kitchen before Rosemount Kitchens came out to see us. They listened to all our ideas and used them to design a kitchen that is exactly what we wanted. Seeing the design in 3D on the computer, helped us visualize the design and gave us confidence. We were very impressed with the professionalism and dedication to getting the job done right. Thank you Rosemount Kitchens. I will recommend you to all our friends. Our kitchen is beautiful and Rosemount were so easy to work with. The tradesmen were top class. Nothing was too much trouble. If something wasn’t done properly they just came out and fixed it. I wish all tradesmen were like that. Thanks so much for the recent letter, and the very welcome extras - the bumpers, screw cover caps, cleansers etc. My kitchen has indeed been a great source of fun with friends and family for the past 12 months, as well as pride in "showing it off" to all. I had a party at Christmas and about 30 friends came who hadn't seen it before, and were very impressed. Of course I am trying to keep it looking as new as a year ago, hopefully succeeding. I have in fact recommended you to several people, but don't know whether anything ever came of that. I'll definitely keep the cards to hand out to anyone else. With kind regards, and thanks once again for all your help. It's great to be able to be positive about the "kitchen experience" when you hear some horror stories from less fortunate people who had bad experiences with other companies. I was about to email you when the cleaning products arrived ( and choccies) - thank you for them. My kitchen has been perfect; I love it. The all white with no handles and electronic opening drawers is fabulous. I have had no problems at all. Also I'm glad I ended up choosing the pure white bench top as I've seen flecked/marble effects in all white kitchens and still prefer mine 100%. I show everyone my kick board drawers, a great idea. Anyway if I hear of anyone looking for a new kitchen I'll give them your card. Attractive, practical, innovative, meticulous… Rosemount Kitchens was recommended to us from a friend and we are ecstatic that we chose them to do our kitchen. We wanted a butlers pantry, but didn’t really think it would fit and are now over the moon that we have a beautiful kitchen with a butlers pantry that is very workable. The builder recommended to us was professional and did the structural work needed for our butlers pantry to become a reality. The quality of materials are excellent and the advice given was very helpful when deciding on our stone bench top. We cannot recommend them more highly. Professional from start to finish. We would like to thank you for our wonderful kitchen, laundry and bathroom vanities. We could not be happier with the finished look and it has turned our ‘tired’ home into something that we love to be in and love to show off. Even when we kept changing our minds on finishes and colours, our designer was patient and accommodating and gave great advice. 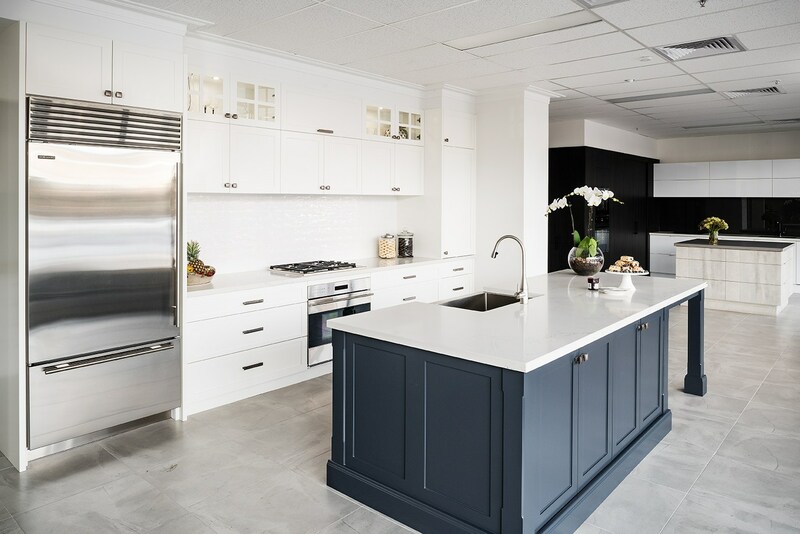 I would recommend Rosemount Kitchens to anyone who is looking to do a renovation. Practical & innovative. Our house in Richmond needed major renovations and due to its size we needed to make use of every available space. Rosemount Kitchens was able to design it to suit the space and incorporate the ideas that were important to us. They were able to custom design our kitchen, laundry and also a vanity in our bathroom to the exact size needed and the finished job is amazing. One of the big differences to others companies we saw was they ‘really’ listened to what was important to us. We get people asking us all the time who did our kitchen and we are proud to say Rosemount Kitchens. We're thrilled with how the kitchen has turned out. It's gone from the darkest to the lightest room in the house. It looks so beautiful and I just love it. Everyone knows that in a project like this, when so many people are involved, some things will go wrong. How you deal with that makes the difference and Rosemount were fantastic. The designer sorted out any issues and nothing was ever a trouble. …the end result is incredible. I needed a custom designed kitchen, as the space I had was difficult and Rosemount Kitchens did not disappoint. The designer came up with ideas that I hadn’t thought of and the end result is incredible. Putting the laundry behind bifold doors was ingenious and gave me so much more space and options. The installation process was smooth and the tradesmen were all reliable and did a great job. Thank you for your professionalism and dedication to completion.